Year: 2017. Player: Frankie Edgar. Odd-sized, thicker and graded cards may be more expensive. If the title & the picture do not match. If the card is serial numbered, it may no longer match the one pictured, as we have literally millions of cards. Tim Sylvia vs Fedor Emelianenko Affliction: Banned Promo card Contact me with any questions. Check out my store for other collectibles. 2011 Topps UFC Title Shot Fighter Relics Card #FRDCE Donald Cerrone. Condition is Like New. Shipped with USPS First Class Package. Player: Rose Namajunas. Item#: MARN. Year: 2017. Odd-sized, thicker and graded cards may be more expensive. If the title & the picture do not match. If the card is serial numbered, it may no longer match the one pictured, as we have literally millions of cards. Check out all my rare cards. Player: Germaine. Year: 2017. Odd-sized, thicker and graded cards may be more expensive. Sport: MMA. If the title & the picture do not match. If the card is serial numbered, it may no longer match the one pictured, as we have literally millions of cards. Player: Cris Santos. Year: 2017. Attributes: Serial Numbered. Odd-sized, thicker and graded cards may be more expensive. If the title & the picture do not match. If the card is serial numbered, it may no longer match the one pictured, as we have literally millions of cards. Year: 2017. Player: Frankie Edgar. Single Cards - Baseball Single Cards - Basketball Single Cards - Football Single Cards - Hockey Single Cards - Non-Sports Single Cards - Soccer Single Cards - UFC / Wrestling. Year: 2017. Player: Nate Diaz. 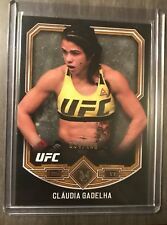 Single Cards - Baseball Single Cards - Basketball Single Cards - Football Single Cards - Hockey Single Cards - Non-Sports Single Cards - Soccer Single Cards - UFC / Wrestling. Item#: MAWB. Year: 2017. Player: Will Brooks. If the title & the picture do not match. If the card is serial numbered, it may no longer match the one pictured, as we have literally millions of cards. Player: Volkan Oezdemir. Year: 2017. Odd-sized, thicker and graded cards may be more expensive. Sport: MMA. If the title & the picture do not match. If the card is serial numbered, it may no longer match the one pictured, as we have literally millions of cards. Year: 2017. Player: Derrick Lewis. Odd-sized, thicker and graded cards may be more expensive. Sport: MMA. If the title & the picture do not match. If the card is serial numbered, it may no longer match the one pictured, as we have literally millions of cards. Player: Stipe Miocic. Year: 2017. If the title & the picture do not match. If the card is serial numbered, it may no longer match the one pictured, as we have literally millions of cards. Odd-sized, thicker and graded cards may be more expensive. Player: Justine Kish. Year: 2017. Our fees, service and organization is top quality. We'd love to see you! The product inside will always be as described. This does not apply if you are purchasing our custom glass display cases (see below) . Year: 2017. SetType: Insert. If the title & the picture do not match. If the card is serial numbered, it may no longer match the one pictured, as we have literally millions of cards. Sport: MMA. Item#: MMRND. Year: 2017. Player: Nate Diaz. SetType: Insert. Sport: MMA. Year: 2017. Player: Arnold Allen. Odd-sized, thicker and graded cards may be more expensive. Sport: MMA. If the title & the picture do not match. If the card is serial numbered, it may no longer match the one pictured, as we have literally millions of cards. Player: Rose Namajunas. Year: 2017. Odd-sized, thicker and graded cards may be more expensive. Sport: MMA. If the title & the picture do not match. If the card is serial numbered, it may no longer match the one pictured, as we have literally millions of cards. Player: Daniel Cormier. Year: 2017. If the title & the picture do not match. If the card is serial numbered, it may no longer match the one pictured, as we have literally millions of cards. Odd-sized, thicker and graded cards may be more expensive. Player: Andrei Arlovski. Year: 2017. 2018 Topps UFC Museum Collection #18 Khabib Nurmagomedov - NM-MT. Shipped with USPS First Class Package. Player: Fabricio Werdum. Year: 2017. They are a representation of the actual card you would receive. Single Cards - Baseball Single Cards - Basketball Single Cards - Football Single Cards - Hockey Single Cards - Non-Sports Single Cards - Soccer Single Cards - UFC / Wrestling. Player: Tyron Woodley. Year: 2017. If the title & the picture do not match. If the card is serial numbered, it may no longer match the one pictured, as we have literally millions of cards. Odd-sized, thicker and graded cards may be more expensive. Player: Abdul Alhassan. Year: 2017. Odd-sized, thicker and graded cards may be more expensive. Attributes: Serial Numbered. If the title & the picture do not match. If the card is serial numbered, it may no longer match the one pictured, as we have literally millions of cards. 2018 Topps UFC Museum Collection Copper #18 Khabib Nurmagomedov. #'d to 159!!! Player: Joanna Jedrzejczyk. Year: 2017. Year: 2017. Player: Nate Diaz. Item#: FAYO. Player: Yushin Okami. Most cards that are not in NM/MT condition should have an actual image of the card. You open at your own risk. Attributes: Autograph, Serial Numbered. NM: Near Mint. Item#: BACS1. Player: Cris Santos. Sport: MMA. Attributes: Autograph. Year: 2011. They are a representation of the actual card you would receive. The product inside will always be as described. Our fees, service and organization is top quality. Card#: FMRAB. Player: Alan Belcher. Year: 2010. I have over 2 million cards in inventory.